Measures and monitors complex RF and microwave signals up to 26.5 GHz. With optional external mixing, the frequency coverage expands to 325 GHz. Save on premium quality used E4440A's. Refurbished, freshly calibrated, certified and guaranteed to work accurately right out of the box - no worries. Purchase easy knowing that your full warranty is backed up by our in house repair engineering department . The E4440A is the go to lab standard favored by professional technicians worldwide. Machines come and go but this one has found a comfortable place on top . It's a great spectrum analyzer and much more. Sired from a fine pedigree of Agilent champions, this unit even has a personality that can even emulate the classic heritage of the 8902A. 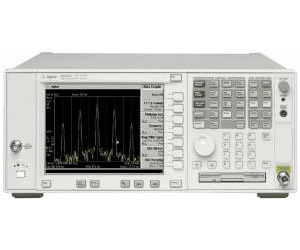 The E4440A is a distinguished member of the PSA family - Performance Series Analyzer. The key word being performance! It's broad at 30-Hz to 26.5-GHz. It can measure slow sweep speeds to get intermittent signals. Zero-band sweep speeds range from 1 µs to 6000 seconds. For spans greater than 10 Hz, sweep speeds from 2 ms to 2000 seconds. Triggering the sweeps is easy with free-run, line, video, and other external signals. The trigger can be delayed 500 ms.
Digital signal processing offers 0.35-dB absolute-amplitude accuracy compared to the common 1.5 dB of lesser machines, and an nice 0.2-dB linearity over a 100-dB range. It does away with most log fidelity errors (0.2 dB total), less bandwidth-switching errors (0.05 dB), and never be bothered by IF gain errors (0 dB) again. Now you can enjoy closer tolerances and shrink guard bands. Cellular telecom electrical engineers love doing adjacent-channel power measurements within a distortion free dynamic range of 113db. Find hidden low-level signals with it's awesome phase noise capabilities in close in mode to less than 30 kHz or use auto mode above 30 kHz to get the right speed. Clearer measurements come with it's 160 resolution bandwidth. Enjoy superior usable dynamic range with a 2-dB step attenuator and balance close-in or far-out phase noise . Connecting to the E4440A is a snap. LANs for data transfers - no problem. PCL3 and PCL5 - piece of cake. Screen and data capture is easy with Microsoft applications. Agilent VEE is quickly accessed with plug-and-play drivers. It even supports printers using a parallel port. LabView and LabWindows makes analysis easy. MATLAB is your general data analysis and measurement automation tool. PowerSuite means you push a button and a world of measurement opens up for analysis of multi-carrier power, channel power, adjacent channel power, harmonic distortion, intermod (TOI), burst power, and spurious emissions.